Is this El Nino really a Godzilla? In August, we took a look at how this winter’s El Niño was shaping up. While most predictions pointed to an El Niño comparable with 1997 (the worst on record), some were predicting that a “Godzilla El Niño” was on its way. Now that we’re in the midst of it, let’s take a look at how El Niño has shaped up. 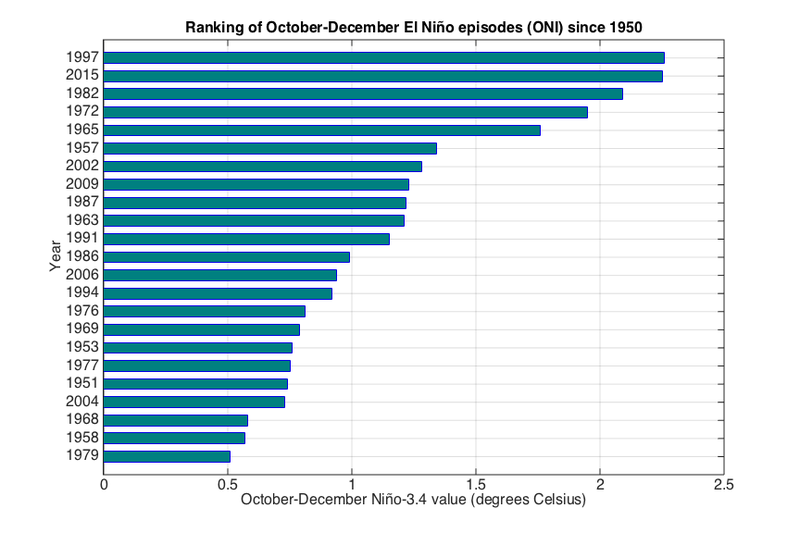 The current El Niño is the second strongest since 1950, marginally behind 1997. It’s strong, but not a momentous version stronger than anything seen before (i.e. a Godzilla). Peru has been hit as hard as expected, with 14 provinces and 2 million people directly imperiled by floods and mudslides. Guatemala City experienced horrific mudslides in October. Hundreds perished. Much of Central America and some of the Caribbean has been hit by droughts, with more than 2 million people in need of food aid. Southern California has received intense rain, with widespread flooding and even tornado(!) warnings in San Diego County. The strongest Hurricane ever measured off either North American coast (surpassing Hurricane Linda from—surprise surprise—1997). A Cat 5 upon landfall in Mexico. The first to land in North America since Hurricane Felix in 2007. It triggered Cat Bonds for the Mexican industry, based on preliminary analysis. As quickly as it strengthened, it dissipated over the central Mexican highlands. The remnants still brought late autumn flooding to Texas. So, is this El Niño “Godzilla”? No. Is it packing a punch? Indeed it is, but nothing significantly worse than before. The most interesting thing is how accurate the serious forecasts and predictions have been: it is supposed to be comparable to 1997, and it is.